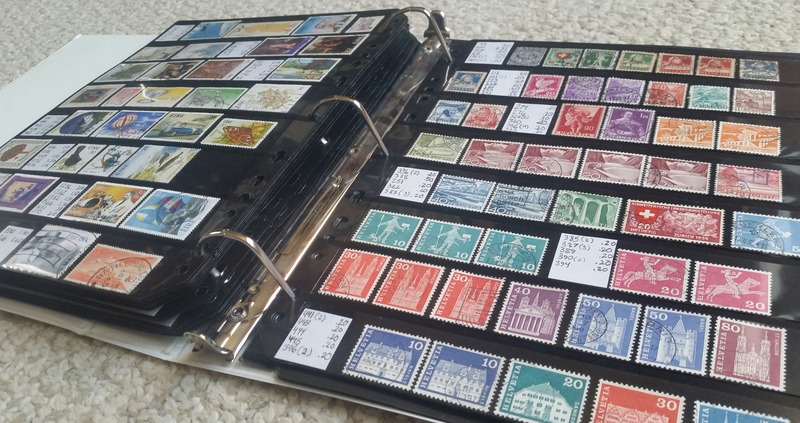 Nordfrim, a major worldwide stamp dealer based out of Denmark, recently contacted me and asked if I would like to review one of their stamp packets. A couple weeks after I said yes, I received the lot in the mail. The collection they sent for my review was a Europe/Overseas duplicate lot (item no. 46630), which, at the time of this review, costs €32.25 or $39.66 (not including shipping, which costs $7 to the United States). 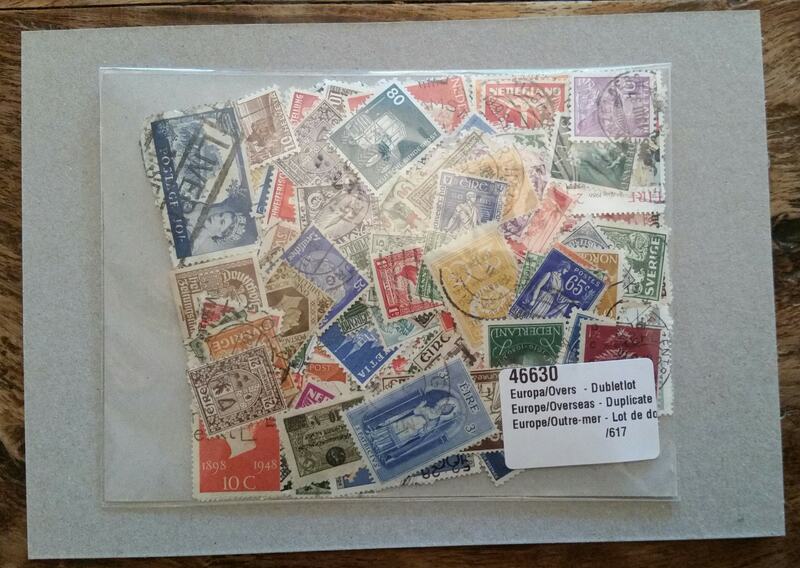 As indicated on their website, the lot contains approximately 336 European stamps, with some duplication. Before I dive in, I just wanted to make it clear that each lot is unique. If you order the exact same item, you will not receive the same stamps as I did. The numbers will likely be similar, but the exact stamps will vary. The lot I received contained a total of 347 stamps, 11 more than the estimate. Although most of the stamps were European, there were also some from Australia, Canada, Malawi, New Zealand, and Singapore. The lot included stamps from a total of 24 countries, but the number of stamps per country was not evenly spread. Six of these countries had over ten stamps, and seven countries only had one stamp. Twelve of the stamps were in mint condition, one of which was never hinged (Scott #576 from Switzerland – CV $2.75). The oldest stamp, from 1882, was from Switzerland (Scott #74). This stamp was a little faulty, with a missing perforation and a small thin and crease. The next oldest was from 1891 – Scott #56 from Sweden. The rest of the stamps ranged from the late 1890s to the early 2000s, with the newest one being Scott #1581 from Ireland, issued in 2004. In terms of value, 59 stamps had a Scott catalog value of $1.00 or more. 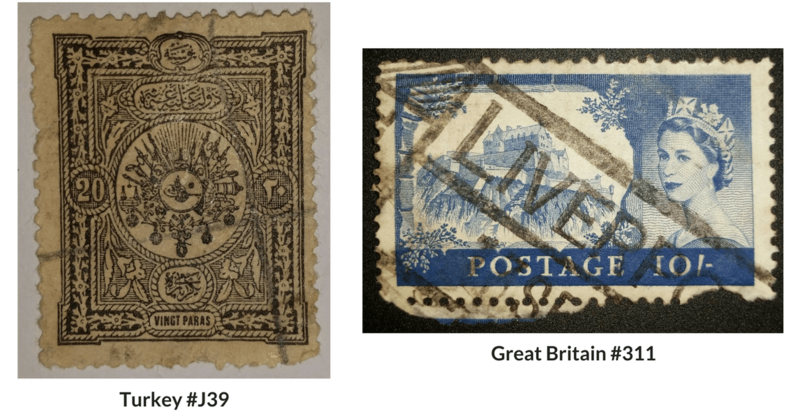 The five most valuable stamps were #311 from Great Britain ($16.00), #J39 from Turkey ($12.50), #69 from Ireland ($8.50), #792 from Ireland ($6.00), and #938 and #712, from Ireland and Germany respectively, both worth $4.50. The average price per stamp, found by dividing the total cost (with shipping, its $46.66) by the number of stamps in the lot (347), was $0.13. 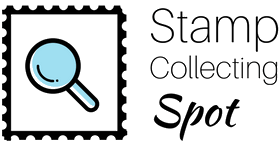 Since the average catalog value per stamp was $0.64, the average cost was 20 percent of Scott catalog value. One factor that is oftentimes overlooked in determining a stamp’s value is its centering. The high prices graded stamps fetch have shown us that there is a premium placed on stamps that are well centered. Even well centered stamps which are not graded can sell for more than catalog value; this can be proven with a quick search on eBay. Therefore, I thought it prudent to examine not only the condition, but the centering of the stamps in the lot as well. A large number of the stamps had excellent centering, with more than 10 of them likely to score at least extremely fine-superb if professionally graded. This alone could bring the value of the lot up, but probably not by any considerable sum since the stamps are all low value to begin with (even with a high grade, a normally low-value stamp is unlikely to bring more than one or two figures). As for sets, there were none which were complete, but there were several partial sets from Switzerland, Ireland, Germany, Italy, the Netherlands, Great Britain, and Sweden. With this review, I’ve tried to present only the facts, hopefully making it easy for you to come to your own conclusions in regards to the overall value received with this lot and whether or not it is worth the price. Remember, every lot is unique. If you order this same lot, the stamps you will receive will be different from mine, and therefore the value will be different as well. This review only serves to show you a representation of what’s included and what you can expect. Also, keep in mind that depending on which country you are in, the total price will vary due to different shipping rates. You can view the shipping rates on the product page by clicking “See shipping”. I hope you enjoyed this review! Please feel free to share your thoughts in the comment section below. I’d love to hear from you! Disclosure: I received this lot free of charge in exchange for an objective review. All opinions expressed here are my own.